Despite a cold overcast day a magnificent 12 assembled at Hassocks Station. 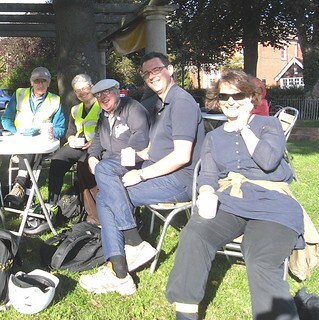 There was our leader John, Joyce, Leon, Roger, Suzanne, Linda, Richard, Angela, Jenny, Anne, Mick and a welcome return of Rob. 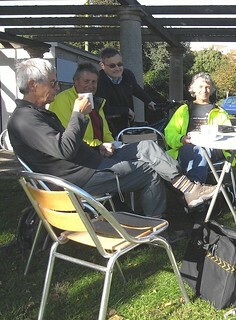 We set off through Hurstpierpoint and Albourne to Partridge Green where the Green Man provided lunch. 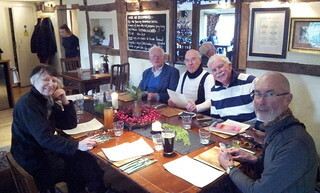 Most of us enjoyed our meal though our pockets let out a small ouch. As usual the conversation was varied and interesting ranging at my end of the table from language learning to the 38 Degree meeting to Clarionette plans for upcoming exciting holidays with Linda off to Morocco, where for one day she has to forsake the bike in favour of a camel to cross the desert. Meanwhile Anne and Mick looked forward to cycling in Cuba with Fred and Amanda and even her rarely sighted husband Rob. 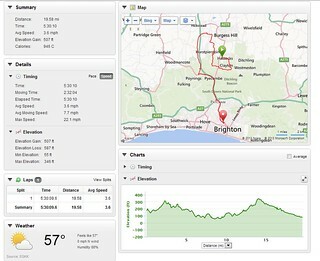 After lunch Rob left to cycle back to Lewes while Joyce and Leon got off to a quick start allegedly to curtail their ride at Henfield. As it happened Joyce was able to keep going all the way to Shoreham. 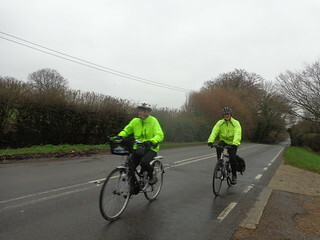 The rest of us set off at a good pace, trying to keep the cold and a bit of drizzle at bay. It has to be said that the car drivers seemed bigger faster and more aggressive than ever. We arrived back at the airport but tea and cakes were declined as it was apparent that by the time they were consumed it would be dark. 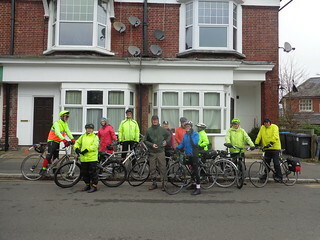 So all made their way to Shoreham Station save Jenny, John and Mick who decided to cycle back to Brighton. Thanks John, for leading the ride. Thanks also to our very own lanterne rouge, Suzanne. We welcome people who want to try one or two of our rides before joining. If you would like to join the Clarion club, click here to download a membership form. We first did a ride incorporating the Shermanbury Place bridleway back in 2005 and we’ve done it a couple of times more recently, but not for a while.. I’ve kept it as “flat” as possible, made the afternoon session a bit shorter than the pre-lunch one. 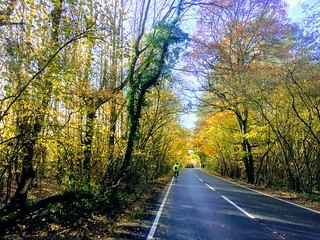 We leave Hassocks station and follow the road to Hurstpierpoint where we turn south once over the A23 and follow the old London road down as far as Shaves Wood where we take the road up to High Cross. 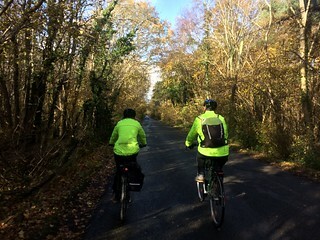 The last bit into Shermanbury involves a short stretch of busy main road, then we take the bridleway through Shermanbury, emerge onto a lane near Wineham and make our way to the Royal Oak for lunch. Then it’s Bobs Lane, Twineham and down to High Cross, then Albourne and retrace our route back to the station. Getting there: Catch 10 45 from Brighton station (earlier train at 10 15 – arrives 10 24). Anyone coming from London should catch the 9 32 which arrives at 10 52. 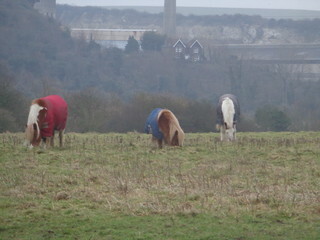 Off road Just the bridleway at Shermanbury – shouldn’t be a problem. Getting back: trains to at 08, 37 and 52 minutes past the hour to Brighton and 14, 24 and 54 to London. There was drama and near-tragedy as Angela and I waited at Preston Park station: a woman appeared to be trying to jump in front of a train, and two men were trying to restrain her. All appeared to have been drinking. The railway authorities were alerted and the fast train came through very slowly, tooting its horn. Then the police took her away. We could not begin to imagine what was going through her mind or what dreadful circumstances had precipitated this crisis. A sobering experience to begin the day. 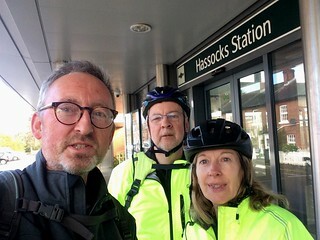 At Hassocks we were joined by Roger, Suzanne and Richard, and had plenty of time to admire the new station building which had replaced the modular concrete construction put up in the early 70s (and which in turn had apparently replaced a magnificent Victorian edifice) as we waited for the later train. It arrived, delivering forth Linda; then Rob turned up in his car, having planned to board the later train at Preston Park only to find that it did not stop there. Sean telephoned to say he was on his way from Plumpton but not to wait; we did wait, but eventually set off, having given him the location of the pub. 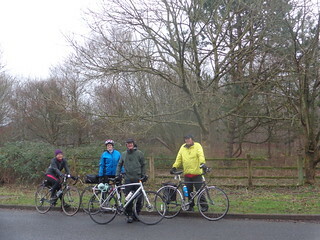 We met up with Sean and Jane in Underhill Lane, at the junction with Lodge Lane. Just before we reached that junction, we noticed that some very anti-social person had flytipped a whole load of old furniture in the lane. Why did they do that, when they clearly had a vehicle with which they could have taken it to the tip? Someone said it’s because they would have had to pay at the tip; but this is not the case at either of the Brighton & Hove tips, so maybe others ought to follow suit. From this, the eastern extremity of the ride, the nine of us proceeded westwards through Clayton, pausing to admire the castellated northern portal of Clayton railway tunnel. I have often wondered why a later, brick-built addition had been allowed to spoil this façade; I am told it is a cottage which is sometimes open to the public. A cottage for whom though? The tunnel-keeper? Who would want to live there, with rumbling noises every 5 minutes? On up New Way Lane, carefully stewarded as ever by our leader, Roger, who gave a short presentation about Danny, the stately home now converted into luxury retirement flats. Apparently if you go to live there you are expected to take your own dining table! Sean, ever the source of fascinating nuggets of information, asked us what we thought Paul Dacre’s father had done during the war. The answer was that he was so patriotic and dedicated to the defence of his country (unlike the “Britain-hating” Ralph Miliband apparently) that he took a job as … a theatre critic! Past Hurstpierpoint College, up Danworth Lane and Pomper Lane (which seemed new territory to me, though apparently not to the Clarion), over the A23 (suppressing the urge to yell obscentities at the cars) and so to the pub, the Duke of York at Sayers Common. 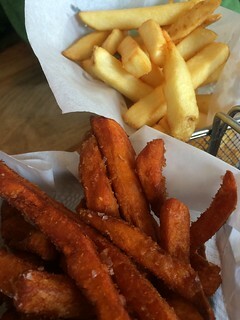 The food was delicious, and the conversation as usual was rich and varied. Angela raised the topic of a Christmas social, with some sort of consensus emerging around a meal preceded by table tennis. But if you have any other ideas I’m sure she’d like to hear from you. Lots of people had come out to enjoy the sun. We saw mud-splattered runners, and horses were much in evidence – some with carriages attached, including one small two-wheeled device apparently known as a jog-cart. At one point a long-necked sheep was also spotted. 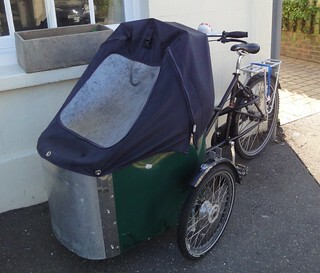 Rob photographed an ingenious tricycle with baby carriage attached, much discussed at lunchtime; Roger had also seen it but thought it was a rubbish bin, possibly the vehicle of choice for a professional but environmentally-conscientious flytipper? After lunch we took the old A23 (now a B-road but you’d never believe it) to Newtimber, where the old London Road – here a quiet, grassy cul-de-sac – becomes the Equestrian Route to Newtimber Place, which we briefly visited before continuing to Pyecombe, the last bit of the journey being on the scary A281. From here it was the safe, but noisy, NCN20 alongside the A23 all the way back to Preston Park. We passed the south portal of the tunnel, where they had forgotten to build castellations, and thanks to Roger’s impeccable timing, reached the park 10 minutes before the projected time of 3.30. At the Rotunda Café we found Fred waiting for us, and also Colin, who just happened to be taking his weekly spin round the park and joined us for a coffee. Linda by now had departed for home; poor Rob had to get the train back to Hassocks to retrieve his car, and Sean and Jane had somehow to get to Plumpton without the benefit of a train (since the line was closed for the day). Thanks to Roger for demonstrating that there is still unpedalled territory out there to explore, and thanks also for arranging such nice weather.